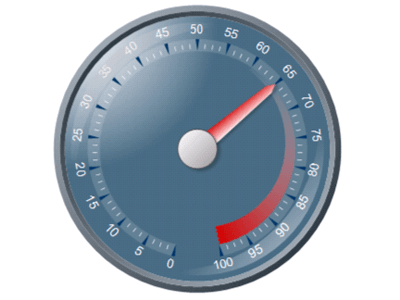 Nevron Open Vision Gauge offers a full range of advanced Gauge types, State Indicators and Numeric Displays that give you a more meaningful way to display KPI's (key performance indicators), dashboards, and other data. NOV Radial Gauge displays axes, ranges and pointers in a circular fashion with controlable begin angle, sweep angle, border style, etc. With the help of this widget you can display the following radial gauge subtypes: Radial, Quarter North East, Quarter North West, Quarter South West, Quarter South East, Half North, Half South, Half West, Half East and others. NOV Linear Gauge displays axes, ranges and pointers in a linear fashion, with controllable orientation (horizontal or vertical). 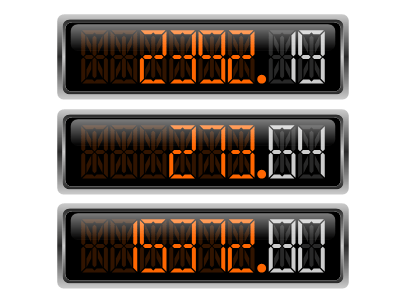 NOV Numeric Display widget displays values in a LED fashion. The following display styles are available: Seven Segment Normal, Seven Segment Rounded, Seven Segment Rectangular, Fourteen Segment Normal, Fourteen Segment Rectangular, Fourteen SegmentInset, Matrix Rectangle and Matrix Circle. Axis Sections conditionally modify the appearance of axis ticks, gridlines and labels, provided they are within a user-specified data range(s). 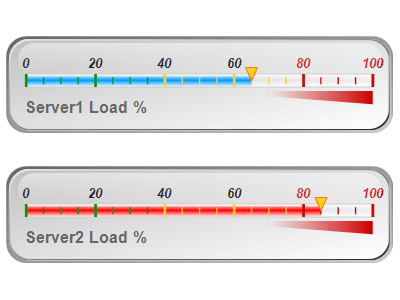 This feature helps you highlight important ranges of data along the axis. Nevron Open Vision Gauge provides advanced axis-label layout options, which let you resolve complex axis-label overlapping cases. Ranges help you visualize the coverage of values range on a certain axis. You have full control over the range offset from scale, appearance and paint order.